Posted 7:01 pm by Erchonia & filed under Press Releases. 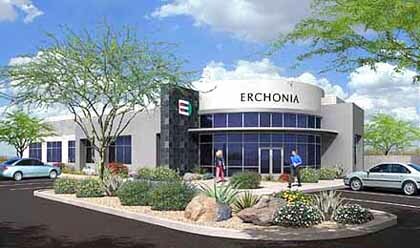 Erchonia, a Mesa-based bio-medical product company, has announced plans to build a new 15,000 square-foot facility to house their operations and accommodate increased sales. Erchonia received the first FDA approval for Low-Level Laser Therapy (LLLT). LLLT is used in pain management, physical therapy and wound healing. The company is also currently involved in a clinical trial for low-level laser assisted liposuction. Erchonia is 85% self-reliant. They are able to perform research, development, fabrication of components and assembly of finished goods in-house. Their ability to develop specialized products from conceptual phase to market reality has helped cultivate a unique niche market. As part of the Business Expansion and Retention Program, the Office of Economic Development worked with Lee & Associates broker, Marc Pierce in site selection, assisted in the permitting process and will continue to work with the company as they apply for a job training grant through the Arizona Department of Commerce. For more information on Erchonia, please visit their web site at www.erchonia.com.